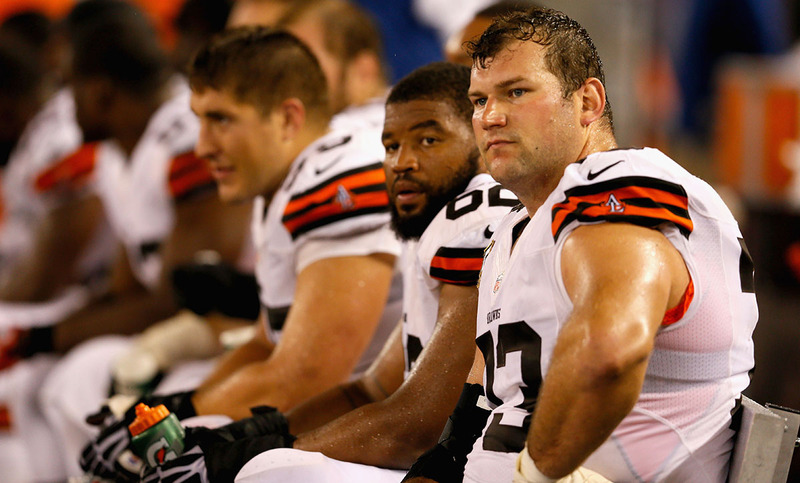 Since he entered the NFL eight years ago, the Browns’ Joe Thomas has endured five head coaches, 14 quarterbacks, 84 losses, and one Johnny Football. That hasn’t stopped him from pummeling the opposition on his way to becoming the best left tackle in football — but what will he have to show for it? Joe Thomas can still remember this feeling coursing through Cleveland. It’s a Thursday in late May, and the Cavaliers will soon tip off the first game of the Eastern Conference finals against Atlanta. The Browns’ All-Pro left tackle was the third overall pick in 2007, not long before LeBron James last dragged the Cavs to the NBA Finals, where they were quickly dispatched in four games. Thomas is sitting down to lunch in the Browns’ cafeteria — a full plate of brisket, potatoes, and a slice of pizza in front of him — and with the Cavs fighting to return to the Finals, each TV in the room is flashing James’s image onscreen. For the Browns, that 2007 season was the last taste of success before nearly a decade of dysfunction. During Thomas’s tenure in Cleveland, the Browns have had five head coaches, five general managers, seven offensive coordinators, and, somehow, 14 starting quarterbacks. It hit Joel Bitonio in the first practice of rookie minicamp last season. The former Nevada tackle was lining up at left guard, which meant that when the veterans eventually arrived, the man next to him would be the best left tackle in football. “During our first practice [as a team], I just kept thinking, Don’t step on Joe’s foot,” Bitonio says. Thomas hasn’t just started every game since he got to the league. He’s played every snap for the Browns offense since his rookie year. Through ligament strains, blowouts, and lost seasons, Thomas has been on the field for 7,924 consecutive offensive plays. The top half of the 2007 draft was an all-or-nothing proposition. Half of the players were spectacular failures, some who flamed out of the league before even finding a second team. It’s full of names like JaMarcus Russell, Amobi Okoye, Jamaal Anderson, Justin Harrell, and Levi Brown. The other half consists of some of the decade’s most iconic players. Thomas was taken one pick behind Calvin Johnson, four ahead of Adrian Peterson. Patrick Willis went 11th, one spot before Marshawn Lynch. Darrelle Revis was taken two picks later. It isn’t difficult to build the argument that the defining players of this generation at five positions — wide receiver, left tackle, running back, inside linebacker, and cornerback — went within a span of 13 picks. And it also isn’t difficult to argue that among all of them, Thomas has built the best career to date. Jay Drowns/Sporting News Thomas in 2006 after a win over Penn State. Thirteen years before he was named Wisconsin’s head coach, Paul Chryst was the Badgers tight ends coach, and the man tasked with luring a high school lineman named Joe Thomas to Madison. It’s typical for coaches to see a recruit compete in a different sport as a sign of moral support and a show of commitment, so in the spring of Thomas’s junior year, Chryst went to a Brookfield Central High School track meet. That afternoon, Thomas launched the shot nearly 64 feet. Chryst didn’t know much about shot put. Thomas’s reaction was his only hope for context. When it was lukewarm, Chryst moved past the throw without thinking much of it. Thomas’s athletic brilliance was always easy to spot, but even now it has more to do with the way he moves than the way he looks. Players at his level tend to look like they’re born of a different species, but those who don’t know Thomas would likely never guess he’s Canton-bound. Sitting in the cafeteria, he’s wearing a gray Browns T-shirt; a tuft of wet hair hangs down the middle of his forehead, obscuring the rest of his hairline, which seems to be headed in the other direction. He’s tall, but not overly wide. His arms look like they belong to someone who knows his way around the gym but doesn’t live there. Some of the tackles that Thomas idolized when he was young — Walter Jones, Willie Roaf, Jonathan Ogden — were built like mountains. Thomas is very much a man. Thomas rarely appears self-serious, even when talking about his career. When asked whether he’d want people to one day refer to him as the best left tackle ever, his response is downright casual. “Sure,” he says. “I’d like them to, but I’m not going to lobby for it.” Thomas says these days that fear is among his most effective motivators. He tells stories of former Wisconsin and Steelers center Mike Webster, 12 years into a Hall of Fame career, running the stairs at Three Rivers Stadium two days after the season ended, convinced Chuck Noll was bringing in a kid to take his job. Whether it’s conjured self-doubt or his everyman face, Thomas has long been an approachable superstar, someone others feel they can emulate in small ways. One week during his sophomore year at Wisconsin, Thomas took his lunch into a meeting reserved for the quarterback and center to plan their calls. “The next week, I had a full offensive line meeting going in there,” says Jim Hueber, the Badgers line coach at the time. A bus ride like this typically would have been quiet. The Browns had just finished a 4-12 season with a two-score loss in Pittsburgh, but as they rolled away from the stadium, the chatter began. When Rob Chudzinski was hired as Cleveland’s head coach in January 2013, there were hopes of replicating that fleeting but magical 2007 season. Chudzinski was the offensive coordinator for the 10-win Browns team when Thomas was a rookie. That offseason, Thomas figured that the Chudzinski era would finally usher in a period of stability. “I think everyone had the impression that it would be this way for four or five years,” Thomas says. “I kind of thought that would be the last coach I ever had.” By the time the bus parked, the news had already spread. Chudzinski had been fired, 350 days after taking the job. Rob Carr/Getty Images Thomas in 2012. In the cafeteria at the team facility, Thomas knows nearly everyone by name. He’s the longest-tenured Brown, suddenly the old guy in the room, but in the past few months, it’s felt like time has gained even more ground. In the second game of Thomas’s career, the Browns beat the Bengals in a 51-45 shootout in Cleveland. Most of the afternoon, Thomas was forced to deal with a 290-pound wrecking ball named Justin Smith. When he held his own, Thomas felt like he belonged. After nearly a decade, Thomas’s first true obstacle has retired. Time moves fast in the NFL. As he’s grown older, Thomas has paid close attention to how the league has changed. He understands the new collective bargaining agreement and knows that young, inexpensive draft picks have become more important than ever. Teams going young means players near the tail end of their careers are even less likely to earn a free pass in their final seasons. “How your career ends … ” he says, “I haven’t talked to anybody who said their career ended just the way they wanted.” Great players are no exception. He cites Brett Favre, who he grew up watching in Wisconsin. The hardest part, he says, is no longer being who you’ve always been. If Thomas sounds anxious, it’s because he is. But he swears that angst comes from looking forward and not back. The idea of ending his career on someone else’s terms is frightening, but the thought of leaving Cleveland without having built a winner is worse. He swears he’s never thought about what it would have been like if he’d landed somewhere else. Cleveland is home. It’s all he knows. And all he ever will. The first, Lou Creekmur, is in the Hall of Fame.